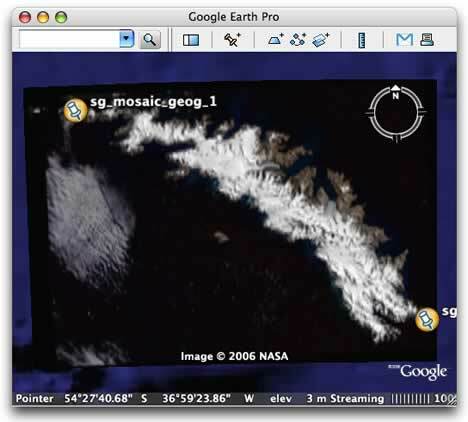 One of the big new features of Google Earth 4 is its support for KML 2.1’s regions — a method for saving bandwidth and CPU cycles by showing tiles of imagery at progressively higher resolutions as you zoom in on Earth, rather than having you try to download and render one gigantic file. The only problem? If you’re authoring a region-based solution, writing the KML and preparing the imagery is not something you’d do manually. And so the lazy and inept among us (I’m thinking chiefly of myself) have been waiting for somebody, anybody, to come out with a software application that automates all this. You know, give it a big file, some coordinates, and out pops the KML and the image tiles. Thanks. Google has tried to egg on developers by releasing the regionator, “a collection of Python classes and scripts which can be used to generate Region-based KML”. But it’s Paolo Mistrangelo of Magellano Progetti in Milan who now has come out with a free tool for Windows that I’ve gotten to work like a charm — Super Overlay Tiler v0.1. SOT is not exactly a standalone application, but the steps involved are straightforward and do not require programming or command-line prowess. In other words, it may not yet be idiot-proof, but it is certainly me-proof. It took a matter of minutes on my barebones Windows 2000 installation to install RMagick and unpack SOT into the required folder. I threw the resulting folder onto Ogle Earth’s server, partly as a demo and partly as a stress test. Start here to check it out. (It’s a bit slow, thanks to my server). 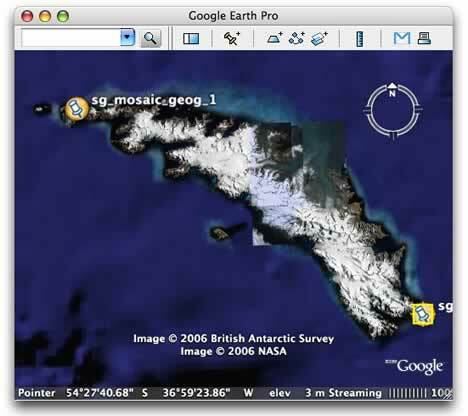 The upshot: If you have a massive image file you’d like to publish to Google Earth, Paolo Mistrangelo’s SOT now makes that a straightforward process. You could have done this much more easily (and a long time ago) in NASA World Wind (http://worldwind.arc.nasa.gov) plus you’d be free to use and modify it how you please, instead of being subject to Google Earth’s commercial use restrictions ( :( ). Actually, this is not very easy to do in World Wind. You have to install and configure FW Tools (not easy), use a rather unfriendly command line tool, manually create a XML file and do some calculations to figure out the parameters for the XML file. While that might sound “easy” to some people, it is not easy for many of us. Easy to me means – 1) Select an image 2) Click Go. I’m not trying to bash WW. I came across this info only AFTER solving how to generate SuperOverlays using Java (with JAI and JDOM). The result is simply fantastic. I am flying through 3D ASTER scenes, VHR IKONOS and anything else. The nasty bit is building the kml, but dedicated hacking gets you there. Obviously, JAI is used to subsample and tile the imagery and JDOM to build up the regions. As it is Java, it runs everywhere, though some serious RAM is handy. I tried out JPEG first, but since geocoding introduces some zero-filled border, this is not so nice (I haven’t figured out yet whether GE allows me to define a transparent colour). But I figured out how to make the borders transparent, though this required PNG. 5 times bigger than JPEG, but still fast enough on local disk. I came to a newly released software Tiles2KML 2.31 that is much more advanced and can import several different satellite imagery formats (greater than 25000×25000 pixels) but what is an added value is the memory management functionality among several other features.